The safari has officially left base camp, and the muslin is well underway. 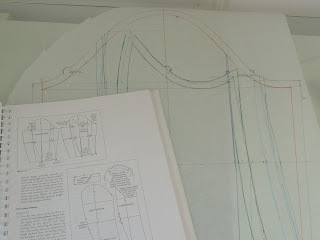 Because I ALWAYS have problems with my shoulders I decided to check the pattern against one of my shirt patterns first thing. Amazing! 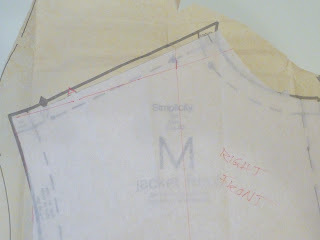 It appears that I won't have to make a sloped shoulder adjustment to my pattern. It seems very hard to believe, but I'm going with it. 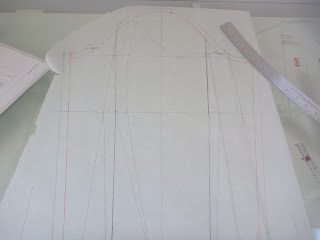 In this pic you see my buttondown shirt pattern front laid over the jacket front. If anything, the jacket is more sloped than the shirt! 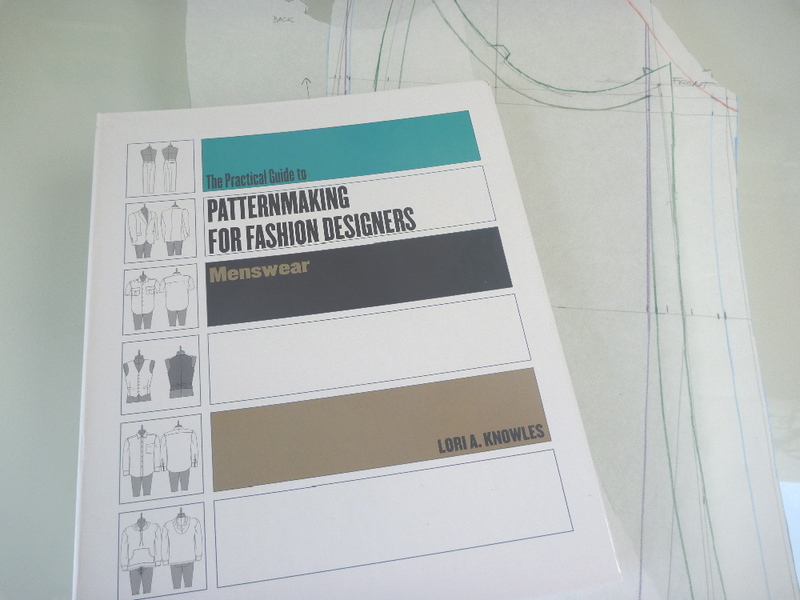 I'm going to be using this textbook by Lori Knowles as my guide. I picked it up secondhand on Amazon months ago. I flip through the pages of this book often, dreaming of being able to draft my own patterns. Time to give it a whirl. 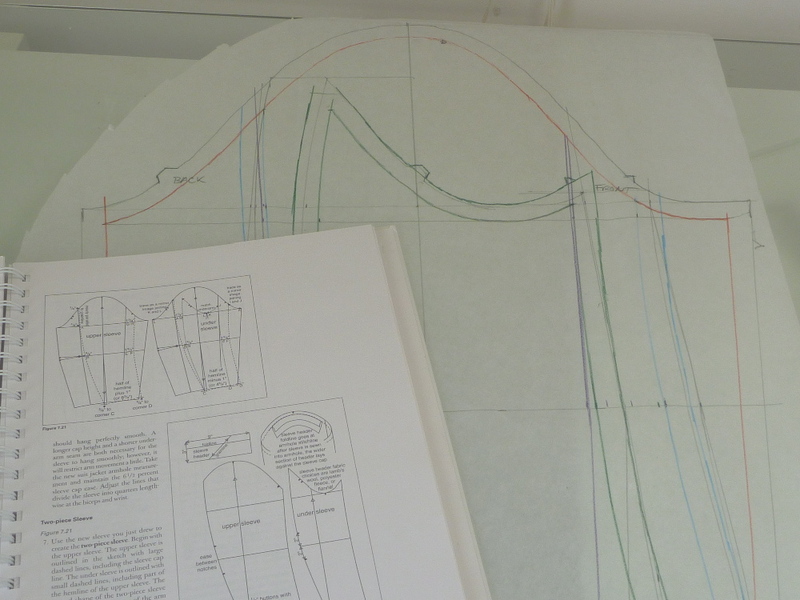 Almost half of this book involves making both upper and lower body slopers from specific body measurements. The process of drafting the sleeve is based on the upper body sloper. I confess, I have not made the slopers, so I'm really just winging it. In the end it's just tracing paper and a Goodwill bed sheet, right? If it works, Great! If not.....well, some other time when I have slopers to work from. Some lessons I learned quickly. 1. 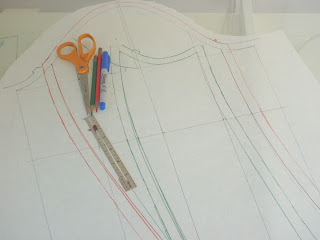 Draft without seam allowances and add them at the end. 2. Use colored pencils. Before I knew it I was totally confused and had no idea what part was what. 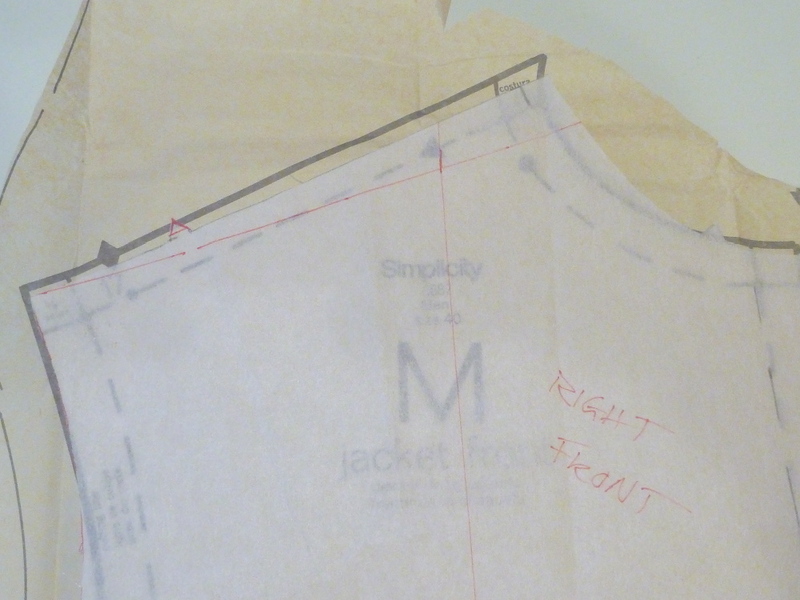 Briefly, using the book as a guide, I drew a grid below the sleeve head (which was maintained). 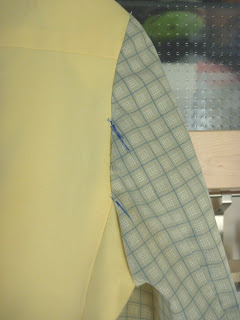 The sleeve is divided horizontally at the arm pit, elbow and cuff. Vertically it's divided into quarters. All the lines work off the grid in a series of very well defined steps. A sloper would have made it even easier, but it wasn't impossible. Amazingly, it turned into a sleeve that fit the armscye! I had some issues with it, however. First, the cuff was too narrow. That should be easy to fix. 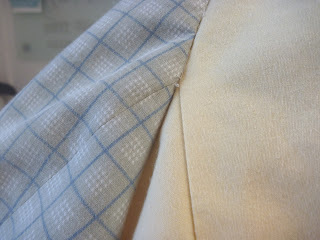 Second, the seam at the back of the sleeve fell between the yoke seam and the side / back seam. It's hard to see so I marked it with a Sharpie. I just really think it looks crappy and would much rather the seam match at the lower mark. YES, I'm a crazy old man! Encouraged by my first attempt I went back to the drawing board. Here are the redrafted sleeve patterns. (My tools are covering a huge mistake that I made!) This was a mindbender but I eventually worked my way through. The upper sleeve had to become bigger, and the lower sleeve became correspondingly smaller. Oy! But..... in the end I got exactly what I wanted! The sleeve seam now meets the back/ side seam perfectly. I have a few more details to iron out. Primarily, what to do about that huge 70's collar. It's got to go! Good job! I've done this before (although never so methodically) and found it pretty mind-bending. It worked out in the end, though. Good for you taking the time to match up that rear seam---it's actually pretty uncommon for them to match, and I really don't get why.